Virginia Election Drawing: Republican David Yancey Wins Each candidate's name was placed in a film canister; those were then placed into a bowl and one name was drawn. Virginia House of Delegate candidates Republican David Yancey and Democrat Shelly Simonds attend an event at Heritage High School in Newport News, Va., on Nov. 28, 2017. Yancey won the tie-breaking drawing on Thursday. 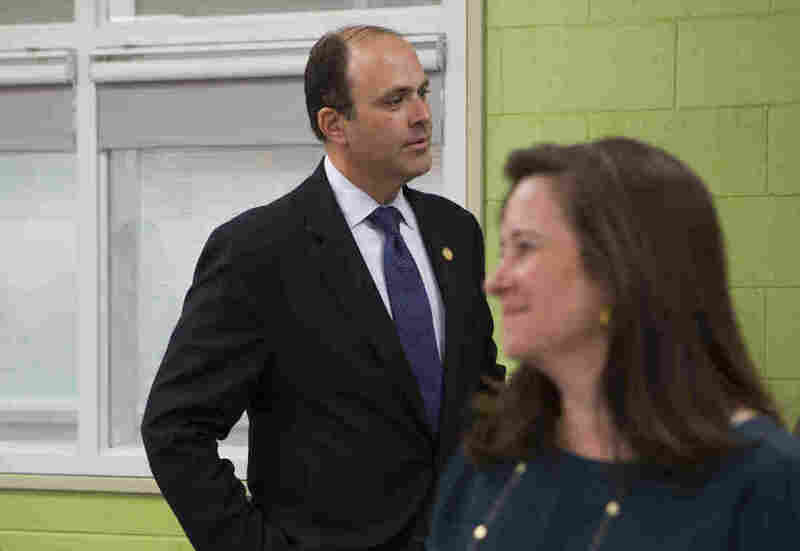 Virginia Republican David Yancey is the winner of a tie-breaking drawing for a House of Delegates seat, a result that appears to allow Republicans to barely hang on to control of the chamber. Each candidate's name was placed in a film canister; those were then placed into a bowl and one name was drawn. It's the latest chapter in an unusual and drawn-out process to decide a winner in House District 94 in Newport News. After a December recount, the Democratic candidate, Shelly Simonds, was initially declared the winner by just one vote. That result appeared to wrest control of the chamber away from Republicans, who'd gone into November with nearly a two-thirds majority in the House of Delegates. That majority was all but swept away in a Democratic wave that boosted the party up and down the ballot. But then, after another ballot was re-examined and counted for Yancey, the Republican incumbent, the race was declared a tie. Each candidate was determined to have 11,607 votes, according to James Alcorn, chair of the Virginia elections board. The ballot that was re-examined has marks next to both candidates. But the mark next to Simonds' bubble also has a slash through it, so judges determined that the voter did not intend to select her. As NPR's Brett Neely reported, Virginia law says that when candidates have an equal number of votes, the state election board shall "determine by lot which of the candidates shall be declared elected." The tie-breaking drawing was initially scheduled for the week of Christmas, but it was postponed after Democrats asked a court to review the process that was used to determine the winner of the disputed ballot. On Wednesday, a court denied Democrats' request to throw out that ballot and said the drawing could proceed this week as planned. With Yancey's win, the GOP appears poised to retain control of the chamber. A win for Democrat Simonds would have likely meant a 50-50 split. Simonds could choose to ask for another recount of the original ballots, though observers from both parties acknowledge it would likely be difficult to convene another recount panel in time for the Virginia General Assembly to convene on Jan. 10 in Richmond. If the session begins with the District 94 seat still uncertain, Republicans would remain in control by a 50-49 majority. Republican leaders have said under that scenario, they would move forward with electing leaders and making rules to govern the legislative session. Another House of Delegates seat, District 28, is still in dispute: in the Fredericksburg area, a group of Democratic voters has asked a federal judge for a new election after a mix-up over district boundaries caused some voters to be assigned to the wrong districts. The Republican in that race, Robert Thomas, was certified as the winner in late November over Democrat Joshua Cole. A hearing regarding the request for a new election is scheduled for Friday in Alexandria. A previous version of this story said Republican Joshua Cole was certified as the winner in District 28. In fact, Republican Robert Thomas was certified as the winner. Cole is a Democrat.